The Greenland shark is also know as the sleeper shark, the gurry shark, the ground shark, and the grey shark. They live the farthest north of all of the sharks and are second only to the great white shark in size, among carnivorous sharks. The Greenland shark can grow up to 24 ft long, but most are around 21 ft. The weight of the Greenland shark is around 2250 lbs. They are not as aggressive as other sharks. They have small eyes and attached to the cornea of each eye is a copepod. They may be brown, black, purplish grey, or slate grey, and the sides can have white spots, dark stripes, or a purple tinge. They used to be thought of as slow swimmers because they live in the arctic but they eat salmon, seal, and caribou. They are still considered slow swimmers but they can put on short bursts of speed to catch prey. The Greenland shark lives in the arctic waters of Greenland at depths of 200 meters. 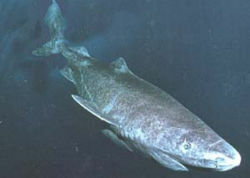 The Greenland shark is the only shark found regularly in the arctic waters. During the summer they live at depths of 600 to 2400 ft., and during the winter they are found near the surface near ice flows. They live near Iceland, Greenland, Norway, Canada, Baffin Island, and along the Scotian Shelf as far south as the Gulf of Maine, and have even been spotted in North Carolina. Most of the time the shark will eat bottom dwelling fish, other sharks, whales, eels, skates, sea birds, squid, crab, herring, brittle stars, seals and sea lions, salmon and halibut, and jellyfish. They have also been found with reindeer, caribou, and dog in their stomachs. Basically, they will eat anything. The Greenland shark has been reported to hunt caribou at the mouths of rivers, similar to a crocodile. The Greenland shark has a relationship with the copepod. The copepod attaches itself on to the Greenland shark's cornea. The bioluminescent copepod is thought to attract prey to the shark because of its luminescence. Because the copepod is attached to one or both of the eyes, it renders the shark blind. There are many different types of copepods, but the one that the Greenland shark hosts is called the ommatokoita elongata. This type of copepod is parasitic. This page was last modified on 8 June 2010, at 14:50.